Our Missouri River fly fishing guides are all fun and courteous professionals with the experience and hard work ethic to make your next Missouri River fly fishing trip with the Montana Angling Company your best yet. Our commitment to our anglers is to providing custom outfitting, expert guiding, and an authentic Montana fly fishing experience. The Missouri River is known to most locals and our Montana fly fishing guides as the ‘Mo. For most anglers the ‘Mo is a special place. Immediately what comes to mind are miles of cold clear water and the large wild trout that thrive in this classic western tailwater fishery. With some of the highest fish per mile counts in the state, some of the largest average wild trout, and consistent hatches throughout the spring, summer, and fall, fly fishing the Missouri River is something every angler needs to experience. Craig, Montana is our home base for our Missouri River guided fly fishing trips and outfitting. Craig sits right on the banks of the Mighty ‘Mo and offers great access to not only blue ribbon fly fishing but also lodging and dining for anglers. Our custom outfitting program means we can put together single- or multi- day fly fishing and lodging packages that make for the ultimate Montana guided fly fishing experience on the Missouri River. Our Montana fly fishing guides all know the Missouri River well and consider the ‘Mo to be one of our homewaters. 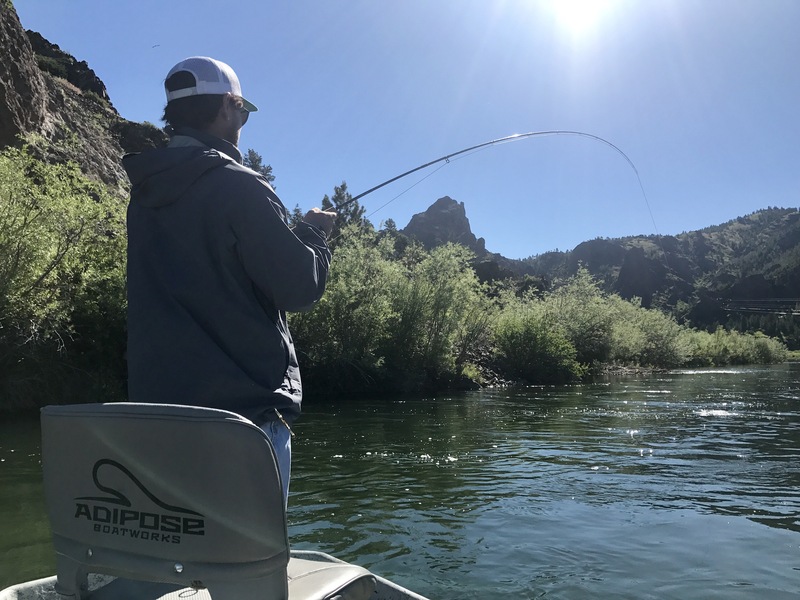 Their hard work, patience, and experience as well as their commitment to personal service make guided fly fishing on the Missouri River with the Montana Angling Company great for seasoned and beginner anglers alike. The Missouri River is a four season fishery for our Montana fly fishing guides but we consider primetime to be April-October. Spring, Summer, and Fall fly fishing on the Missouri River all have something different to offer, but anglers can count on great fly fishing throughout the year. Reliable hatches, a consistent supply of cold water, some the highest trout per mile numbers in the state, and some of the best dry fly fishing in the state make the Missouri River a favorite amongst anglers and our Missouri River fly fishing guides.